Close-up of a conveyor belt used in the production of tissues. INTRALOX’S latest conveyor solutions for tissue applications will be on display at Tissue World 2006, March 14-17, in Miami, Florida. Recent product innovations from Intralox have addressed the greatest challenges facing the tissue industry. Intralox uses a team-oriented approach to focus on developing a specific solution for every application. As a result, companies have more than 3,000 different combinations of belt styles, components and materials to meet their needs. * Series 400 Angled Roller belt - This innovative product is ideal for case switching, turning, aligning and diverting. * High Speed Intralon Radius edge - Optimal for cut roll handling applications. This specially formulated nylon-based blend withstands contact pressure in high speed radius turns of up to 500 feet per minute. Costs of belt ownership are reduced with extended belt life and less downtime for unscheduled maintenance. * EZ Roller Retrofit system - Retrofitting an existing roller conveyor to an Intralox system takes about 50% the time required to replace roller conveyor. Belt styles and accessories are available for every type of package handling conveyor: straight runs, radius turns, inclines, low pressure accumulation, etc. 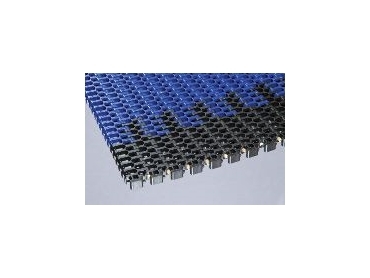 * Spiralox belts - Solutions for spiral conveyors reduce floor space requirements for incline/declines and accumulation of naked rolls and cases. Intralox will be at Booth #1120 during Tissue World 2006.